Verizon announced Tuesday that it’s buying AOL Inc. for $50 a share, valued at approximately $4.4 billion, to bolster the company’s plans for mobile and web video. Verizon is looking to distribute content through its wide mobile phone network. Verizon is the largest mobile phone operator with 1.5 billion connected devices, AOL CEO Tim Armstrong told USA Today, adding that “the whole word is shifting to video.” Armstrong will continue to lead the AOL team, Verizon said. Beyond content creation, Verizon gets AOL’s advertising arm and several online properties that include The Huffington Post, TechCrunch, Engadget, among others. Verizon will also get AOL’s dial-up Internet service, which still has more than two million subscribers. 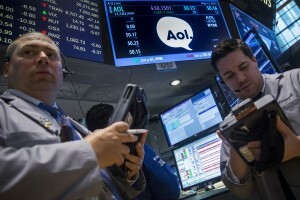 In its heyday a decade ago, AOL had 21 million dial-up Internet customers, Quartz reported. According to The Wall Street Journal, Verizon’s president of operations, John Stratton, specifically singled out AOL’s advertising platform at an investor conference Tuesday, as a potential means to compete with the likes of Google and others with online video ads. Pending regulatory approval, the deal is expected to close this summer.